The story of The Robins thus far is shaping up to also be the story of The Ravens, a group we know well. In just two months as a recording group The Robins have had three releases encompassing a total of four songs, this being the fifth, and their stylistic debt to the older, more established group is pretty clear. Not only were they formed by bandleader Johnny Otis specifically to give audiences on stage at his Barrelhouse Club a reasonable facsimile of the established hit-makers for audiences who probably would never get to see The Ravens in person, but doing so also gave Otis a skilled vocal group to use on his records which had previously consisted of instrumentals and comedic skits set to music. This imitative act was hardly much of a gamble for Otis to take. The Ravens were still the benchmark that most rock acts, not just vocal groups, measured themselves against. With nine national hits to their credit in just two years, plus a handful of other regional hits to their name, they had the most verifiable success of anyone in the rock field to date. Furthermore their sound was unmistakable thanks to the sonorous bass leads of Jimmy Ricks, so provided you could replicate that specific attribute the corollaries would be unmistakable even if you altered everything else. 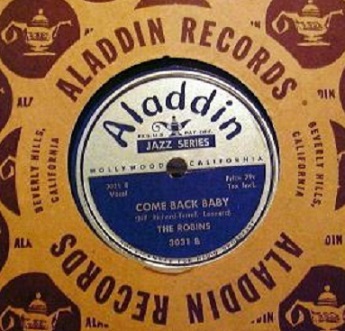 Since you can’t trademark a vocal style, let alone bar any other bass singer from using their voice to sing, The Robins primary objectives in mimicking The Ravens came down to the quality of their own records and the willingness of record buyers to fork over 79 cents to hear something that was derivative at its core. Thus far nobody seemed very interested in their work but yet to be determined was whether that was a conscious choice by audiences to avoid them or if it was simply a matter of The Robins not being well known enough for people to seek them out. The interesting part of all this of course is that seven decades down the road we know both groups were successful. The Ravens had more hits in their era, while The Robins had a slightly longer run, albeit with their biggest success coming once they adjusted their approach away from being a Ravens knock-off. But they also scored AS a Ravens knock-off around the corner (sorry for blowing the surprise for those who hadn’t yet heard the news) so we’re trying to get some sense as to how their tactics contributed to their ultimate breakthrough or conversely how those same tactics kept them from breaking through even earlier. In other words, if you were going to be imitating the vocal style of the biggest stars in the field was that a hindrance or a benefit to your own commercial success? Though this doesn’t give any definitive answer itself, the ensuing evidence suggests it certainly didn’t hurt. Though rock ‘n’ roll music had been around for a year and a half to date and had been commercially successful since The Ravens first broke through at the start of 1948, and the style as a whole was garnering more sales, more hits, more attention and more artists coming into the field every day, the numbers for all of those were still somewhat small. We’ve had just about seventy five artists releasing what could be legitimately called rock records through June 1949 and at least a dozen of those acts, if not a few more, were pretty inconsequential. Whether artistically, commercially, or in terms of their total output, which in some cases consisted of a lone record never to be heard from again, or those who ventured over from another field before heading right back to where they came, the fact is rock was still a pretty small club. There were no more than forty who could at this point be deemed consistently reliable performers. Now those artists did run the gamut from honking sax players to dynamic vocalists, from stand-alone solo acts to bandleaders overseeing a number of instrumentalists. But in the vocal group realm there were just two acts, The Ravens and The Orioles, who met all of the qualifications of stars. Naturally those who came along at this stage would follow in the footsteps of those as closely as they could. For the Robins it was The Ravens who provided the blueprint and it had not only gotten them together in the first place, but had gotten them their first shot on record – as The Four Bluebirds behind Otis back in April on My Baby Done Told Me – and then got them their own record deal for Aladdin the very next month. This was their second release for that company in a matter of weeks, giving plenty of indication that others felt their chances were quite good to break through. Success might be best seen by hit records, but when starting out in the business success was determined by simply getting to MAKE a record! Three records in three months? That was the jackpot! If you don’t think so ask The Velvetones who spent a decade toiling in the bushes with few releases to show for their troubles. So if aping The Ravens was what allowed you in the studio doors and once inside you could pull that task off with reasonable skill, that was more than most groups who knocked at the door and were constantly turned away. Don’t feel sorry for The Robins however if you think they were callously forced to shoehorn themselves into somebody else’s game plan as part of some Faustian bargain to get their shot at the brass ring. You have to remember that for The Robins it was the work of The Ravens that they were exposed to everyday as part of the generation coming of age then. In other words, they were the audience BUYING those Ravens releases and sending them up the charts! 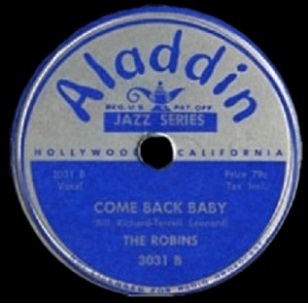 When The Robins convened in late May the most recent Ravens record, Ricky’s Blues, was just out on the market and hadn’t made a big enough commercial impact yet to be picked out for exploitation by the powers-that-be at Aladdin. In fact National Records were still promoting the treacle known as The House I Live In, as the plug side of the single. It was the younger rock audience, the same demographic The Robins belonged to, which rejected that out of hand and instead embraced the designated B-side which would crack the charts in mid-June. 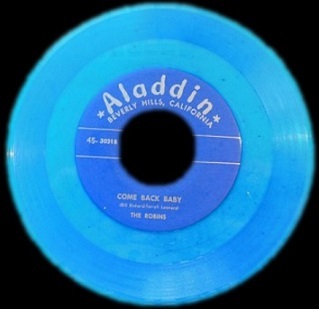 The Robins clearly picked up on it before anyone else because Come Back Baby, written by the group, was quite obviously taken from Ricky’s Blues. It’s not a complete hold up of the stagecoach, but let’s just say they’d be persons of interest once the driver reported they were stuck up on the trail by a bunch of masked desperados who absconded with the song in question. Both songs have prominent piano opening, The Ravens a little more insistent but similar enough in setting the rhythm. The tempo is the same, as is the overall theme of looking back at losing a girl, and of course the vocal traits of each lead only forged a deeper connection in people’s minds. There are differences of course and those are ones we’ve mentioned before as positives for The Robins, as they smartly didn’t rely on Nunn’s bass voice to carry the ball as much as Jimmy Ricks was called upon to do for The Ravens. Instead The Robins take the lead in unison and leave Nunn to answer their lines and deliver the capper in each stanza, which is a far more judicious use of his vocals than it’d be if he was left exposed by himself for the majority of the song. No matter how good he may sound, he wasn’t going to sound nearly AS good as Ricky and the less apparent that was, the better it’d be for all involved. It’s also more effective for their purposes because it hints at The Ravens more than shamelessly steals from them. In other words you get the impression of the other group while still leaving room for variations that might get you noticed more on your own. But even with the caginess of this decision in their favor we still come back to the other factor that will determine their ultimate success or failure. The song itself. Come Back Baby is somewhat run-of-the-mill by nature. The pieces are all usable and fit together well enough, but none of it really stands out. The vocals are the entire focus after that piano recedes to the background following the opening. We get no instrumental break whatsoever, as a matter of fact we get no other instruments other than the skeletal rhythm section which remains fairly muted in the background. This was their mistake, and where the absence of Johnny Otis’s band really hurts, because it forces them to rely more on The Ravens overall sound which was similarly lacking instrumental textures. That group was able to overcome this as much as they did thanks to their superior vocal arrangements and the skills of the individual singers, but even The Ravens were increasingly being hemmed in by not expanding their instrumental palette. The Robins didn’t have that take that same approach and here is where they really could’ve separated themselves in the process. By using The Ravens vocal blueprint but adding a far more vibrant and diverse musical arrangement with a snaky electric guitar maybe, or some riffing horns topped by a wild sax solo in the break, they’d have taken on a persona of their own, independent of The Ravens. It’d also probably have been a little more appealing to the most recent younger converts to this music who were gravitating towards the blistering excitement those sounds provided, and so you’d have essentially given listeners a clear choice between the two groups. If you liked The Ravens but felt they were veering too much towards the mundane then The Robins would be more up your alley. You’d get the best of both worlds in the process and that alone might put some distance between them in the public’s mind. They wouldn’t manage that of course until they were back with Otis recording for Savoy in the fall and not surprisingly their breakthrough followed immediately after that move (okay, we peeked ahead, but we’d have made the same recommendation without knowing the end results!). So Come Back Baby stands as their final effort in a blatantly obvious Ravens approach. As imitative records go it’s as good as the others, but no better. The storyline isn’t deep enough to compensate for the unoriginal arrangement and when tackling similar styled songs The Ravens will always have the edge. The one bit of promise that shines through is the ending, a spotlighted vocal ascension of each singer separately as they meld into one, something which shows creativity and confidence that they weren’t stubbornly going to remain beholden to the designs of somebody who, by all rights, they should’ve been competing against, not genuflecting for. Soon they would and that’s when The Robins would join the ranks of the hit-makers and trendsetters on the rock vanguard, leaving The Ravens behind to try and consolidate their own legacy as it moved ever further away from them as the next decade dawned when groups like these Robins sat on the highest perch. Leave a reply on "The Robins: “Come Back Baby”"